Preventing food stamp fraud begins with confronting criminal thoughts before they become crimes. Triggering positive behaviors is the heart of this campaign. Food stamp fraud is a crime. Using food stamps for the purchase of items other than food or qualified products is also a crime. Administered by the Indiana Family Social Services Administration (FSSA), the food stamp (SNAP) /EBT program serves thousands of Hoosiers who need food assistance. 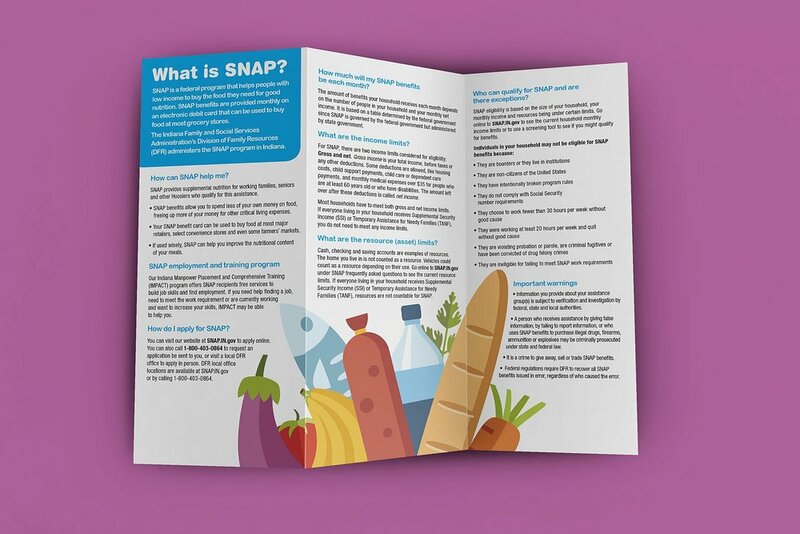 The FSSA is aware of misuse of SNAP/EBT services by users (consumers), and retailers who profit from the resale or exchange of SNAP/EBT cards. Internal challenges were also found where FSSA interviewers were not equipped to ask the “right questions” to filter out unqualified applicants. Training tools were created to enable, encourage and support their efforts. Cabello’s strategic approach required a look at the big picture – to fully understand the SNAP/EBT process, system, the consumer/user, retail partners, and the mindset of those who aim to misuse the system. Internally, SNAP/EBT agents needed support to do their job better. Externally, SNAP/EBT users needed to understand that fraud was not acceptable, under any conditions. Cabello began at the very point of engagement – where an FSSA interviewers and representatives throughout the State of Indiana engage with a food stamp applicants. This is where food stamp fraud begins. Cabello cleverly repurposed the existing national SNAP program logo to become a functional asset in the overall message strategy. It became more than a logo. It was our core message. “Stop SNAP Fraud”. How do you penetrate the mindset of an individual – to engage and encourage positive food stamp use and deter fraudulent activity? Cabello strategically developed the “Only for food. Only for you.” campaign to set friendly parameters of understanding for SNAP/EBT users. Much is addressed in these two short sentences. “Only for food” addresses the notion that a SNAP/EBT cardholder cannot purchase anything other than food, such as alcohol, cigarettes, gas, etc. “Only for you” address the idea that SNAP/EBT cards are non-transferrable and cannot be sold for profit or cash.